Sagetech has scored another success with the sale of one of its ZM vertical panel saws to the highly regarded Mary Hare School near Newbury, which specialises in the education of deaf children. Now in its 70th anniversary year, Mary Hare School replaced an original school founded by the highly accomplished Mary Adelaide Hare in 1916 in Burgess Hill. In 1947 the school moved to its current premises at Arlington Manor near Newbury where it now occupies over 130 acres, providing some of the best facilities for deaf children in the country. The school, owned by Mary Hare Limited www.maryhare.org.uk, is part of a much larger operation which includes training of clinicians for a large high street chain offering audiology services, and Arlington Laboratories, the second biggest manufacturer of ear moulds in the UK. They even have their own hearing aid centre. “Since installation, the saw has been used extensively; recently we built a new boarding house, and when the fitted bedroom furniture arrived, the contractors’ parts were over size, and the saw was especially helpful in making the necessary precise adjustments. 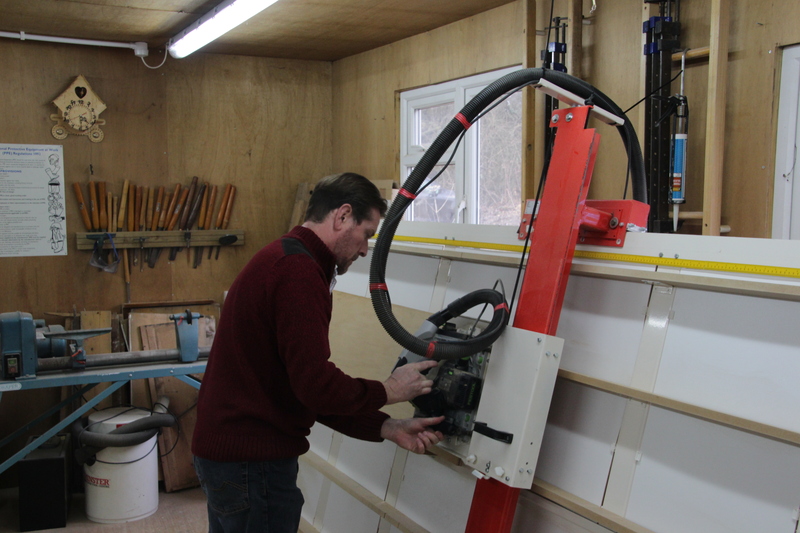 One of the biggest benefits is that it is saving our backs; it is so much easier to carry in a sheet and just drop it on to the saw than it ever was with a table saw and then having to move it through. We like the fact that it cuts square and so accurately, which saves us considerable time on site when fitting the results. The optional vacuum unit has cut out the dust in the air and residual dust on the workpiece, making this process much cleaner.” David did jokingly remark that because they had been struggling for years when they got the ZM saw in, they were not used to having such a facility and took time to get used to the idea of using it! Indeed, he is clear that he wouldn’t be without it now. Mary Hare’s ZM12 is the smallest of the Zapkut ZM range of machines, which is a 8’ x 4’ (2500 x 1250 mm) capacity unit. This is just one of the now four ranges of machines offered by British manufacturer Sagetech, who specialise in vertical panel saws for the smaller business. The Zapkut brand is for lighter duties, and in addition to the ZM range they also offer a unique ZK portable unit in two sizes, which when not in use can be folded up compactly and stored conveniently, say hanging on the wall. The Koolkut brand is for those needing a heavier duty machine, where the KF and KK Koolkut units offer capacities up to 3.1 x 2.1m, so these are easily capable of handling the big 3 x 2m sheets. Sagetech thus provides a very comprehensive range of sizes and models, enabling their customers, whose needs range from intermittent cutting to the higher end users (with some even cutting an average of about 150 sheets a week), to select the most compact, space-saving solution appropriate to their business.